Recently we have launched the Caesar testnet including content uploading functionality, IPFS integration which allows peer-to-peer file transfer, and the GUI Wallet. Our latest sprints have been completed, and our development team addressed the most critical issues in the first testnet, Caesar. 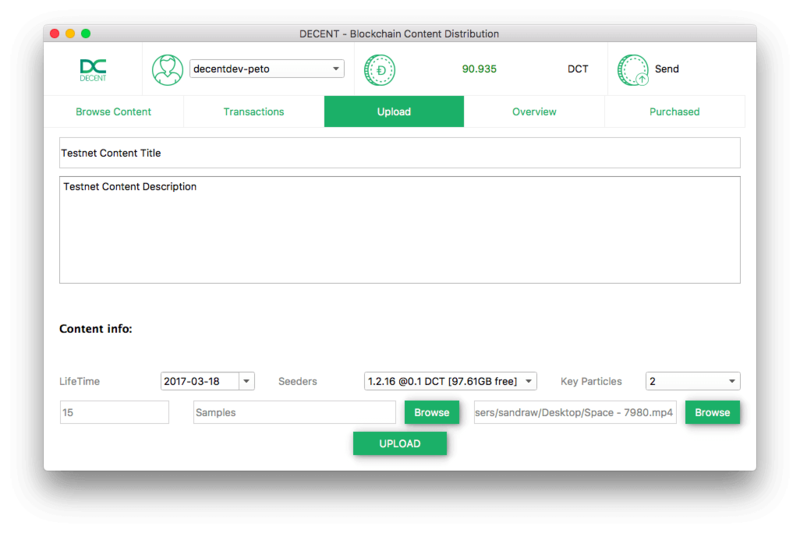 The DECENT development team has now fully developed Caesar’s core features, mainly the GUI Walletand the entire transactional body of the future DECENT Network. For testing purposes, the GUI Wallet has enabled three improvements in uploading, downloading, search, and rating contents. After searching for a word or phrase, the list of results is displayed to the user along with information about the selected item in popup window. That info contains the author’s name and ranking, the item’s size, description, and price. Authors can upload digital files into the DECENT Network, and they can decide to price their content or leave it free. 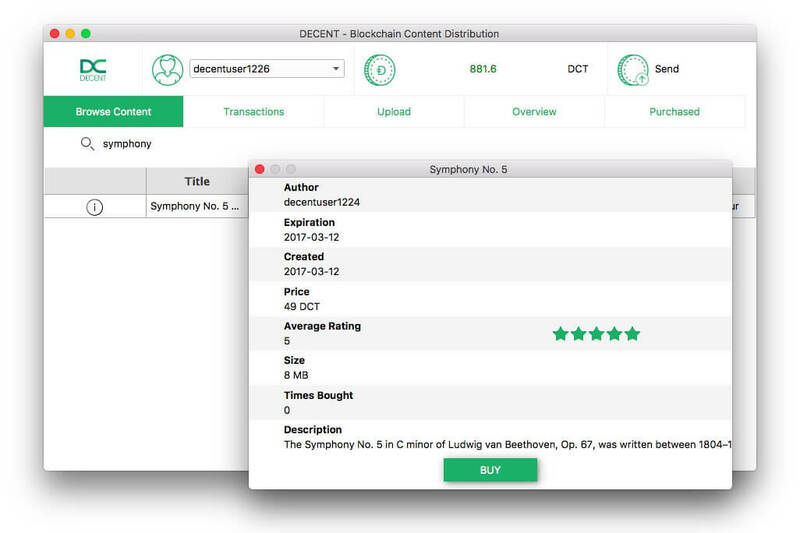 DECENT’s blockchain keeps the records of transaction data and author reputation. Additionally, the development team has finalized the full integration of IPFS that handles the download and upload function with an interface that’s similar to Libtorrent’s TorrentDriver. We have started coding the Web Wallet, while Sprint 2017-E focused on user experience and stability issues. We added a “see more” feature in order to display file size, length, author, and a “buy content” button. We’re also debuting a transaction tab and along with it, a support forum, which you can be accessed by an invited tester. Would you like to gain the access to DECENT Testnet as well? Register now! There’s also a rating functionality in the GUI Wallet. After a user purchases something, they will be able to rate it. The “Transactions” tab allows users to search accounts and see detailed information about users, such as their upload and download history. Sign up for our newsletter, andremember, you can always leave your feedback and discuss DECENT’s features through our official chat groups on Slack and Telegram as well!